This Spray 27 was build in wood by a German sailor. 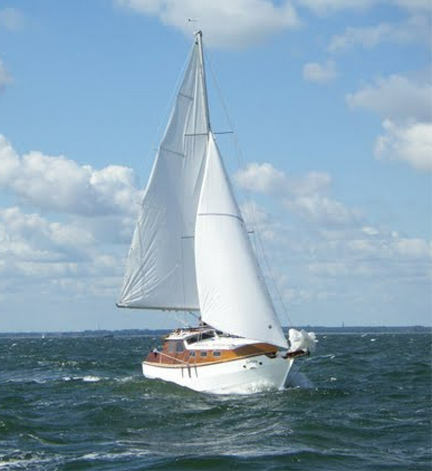 SPECIAL INTRODUCTORY OFFER: COMPLETE BOAT PLANS & FULL SIZE FRAME PATTERNS OR CUTTING FILES ... Delivered by DOWNLOAD to your computer within 12 hours of you placing your order. 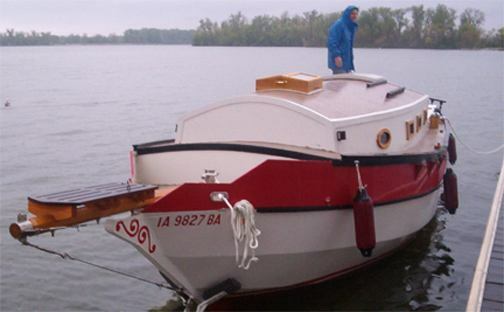 Each plan contains all the construction drawings for either STEEL, ALUMINUM, FIBERGLASS OR WOOD EPOXY construction, plus bonus drawings covering electrical, plumbing and engineering, everything you need to build your boat. COMPLETE PLANS & PATTERNS SPRAY 27 both A & B versions included. After several builders asked for a trailerable stretched version of the Spray 22, we produced the Spray 27.....This boat is incredibly popular ... over 300 sailing world-wide. 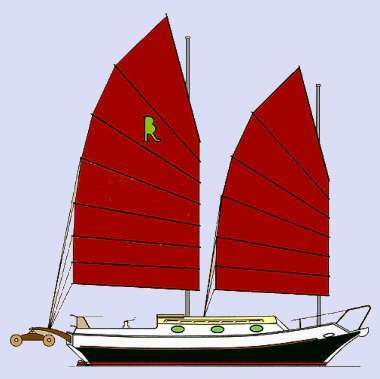 There are two basic layouts - either regular or pilot house - and either can be rigged with a gaff sail plan or as a Bermudan sloop. 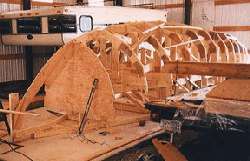 Both regular Trunk cabin and Pilot house versions for each material - STEEL, ALUMINUM, FIBERGLASS & WOOD EPOXY as applicable to the particular boat plan - with up the boat plans. Check out our SPRAY NEWSLETTER for details. L.O.D. 8.23 m 27' 0"
L.W.L. 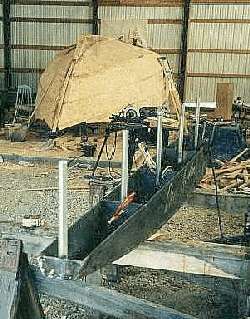 6.55 m 21' 6"
BEAM 2.59 m 8' 6"
DRAFT 0.84 m 2' 9"
Gaff sloop shown. 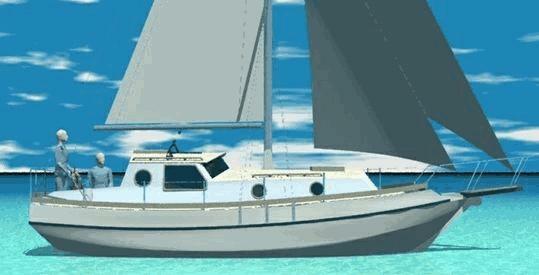 Bermudian Sloop & Junk rig also included with boat plans & study boat plans. Here we see the profile and plan view of the accommodation. Other layouts are possible and many builders make changes to suit their own particular requirements. Here is another rig that will suit this boat ... the junk rig is very popular with Spray owners who report that the rig is easy to handle and performs well on their Spray. 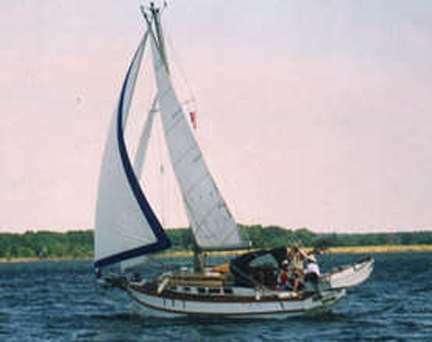 Another gaff rigged Spray 27 .. this particular owner is very pleased with his boat and particularly likes the gaff rig. 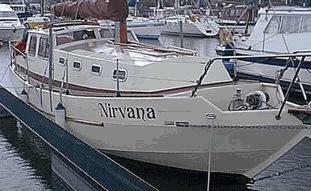 One competent computer operator who was also a Spray 27 builder wanted get a better idea of how his boat would look ! Here we see the profile and plan view of the version B accommodation. Other layouts are possible and many builders make changes to suit their own particular requirements. 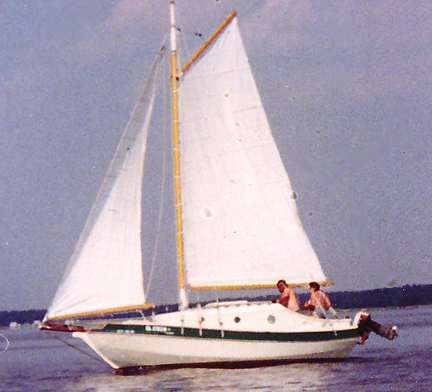 The lifelong desire to sail has prompted my present (major) project, a Spray 27 cutter designed by Bruce Roberts. This is the second smallest of his Spray series and the larger of the two trailerable ones. 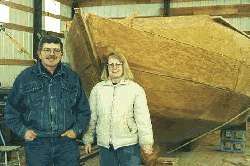 A multi-chine plywood design, the cutter can be built with either Marconi or gaff rigs and in either pilot house or conventional sailboat configuration. Luckily, decisions on those two matters need not be made until bulkheads are installed, so I have a while yet to decide. First, the Sprays have a conventional transom which turns to vertical for the upper one foot. I kept the taper of the transom all the way aft, which will increase cockpit (or lazarette) space and overall length (to about 28'). The shape is more pleasing to my eye. Secondly, I am building the hull with a modified stitch-and-glue or, more accurately, epoxy chine method. Ive built the hull over the same temporary frames specified but eliminating the chine logs and instead edge-gluing the plywood panels with filled epoxy. The hull is roughed in and when fibreglasses will be turned over with the temporary frames still supporting it. At that point the fillets of filled epoxy will be installed inside as the chines. This modification was done with the blessings of Mr. Roberts himself, incidentally. 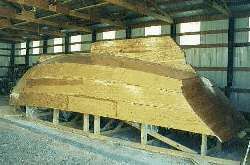 A Spring 99 Update: I completed the planking, built up the keel with fir, and built a steel ballast box to be later filled with lead and thickened resin. This ballast box, still empty, was fitted into place and the wooden keel laminated up around it. Then I removed it to be bolted in position later with the hull upright. I also located an old-but-good Yanmar 8h.p. diesel, the old horizontal cylinder model, and purchased it for later installation. 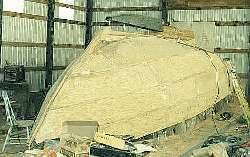 A stern view of the hull, now covered with 6 oz. fiberglass cloth set in epoxy resin. (Much sanding and fairing remains before it will be ready for paint.) To turn the hull we had, naturally, a party. Two heavy Polly ropes were run from the ends of the trusses on each side of our pole shed, under the hull (but over the building form), then to cable-type come-along's. To protect the hull we padded the area with tires and also put foam pipe insulation over the ropes. 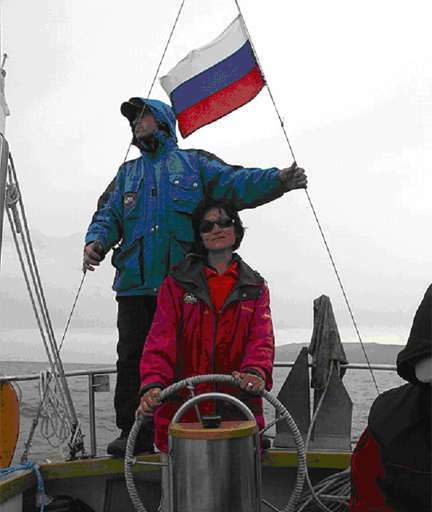 Then we cranked on the come-alongs until the hull lifted off the form. We lifted the hull until it went over gently onto the ropes. Then everyone quickly skidded the building form forward out of the way. Then we pushed the hull back onto the concrete building platform and blocked it. completing lamination of the wooden sections.